My daughter is definitely a combination of two critters: a bookworm and a night owl! :big grin: She rarely falls asleep when her head hits the pillow at night and usually likes to read a few of her books instead. Michael and I have strict rules about Riley's lights being off at night so that she can rest better and eventually doze off, but we do allow her to have a small night light in her bed to read by. The problem is, this night light is made for adults, not children. It's hard to hold, uses batteries and sometimes gets a little warmer than I'd like it to when it's accidentally left on. That's why I was thrilled to try the new MOBI TykeLights AnimaLamp for Riley's late-night reading habit. I reviewed the TykeLights AnimaLamp Portable LED Light from MOBI Technologies which retails for $24.95, but is currently on sale for $24.67 with FREE SHIPPING. The MOBI TykeLights AnimaLamp Portable LED Light is an adorable portable lamp that features 12 energy-efficient LEDs to light up your kid's activities. These lights offer cool, white light which is easy on the eyes. The brightness can be adjusted easily and simple touch operation ensures that even young children can operate this lamp with no trouble. What's more, you won't have to worry about the light getting hot or running through an endless supply of batteries either. The AnimaLamp comes with an AC adapter as well as a rechargeable Li-Ion battery. If using the battery, you'll receive a full 10 hours of use per battery charge. The tilting lamp head also ensures that light can be directed exactly where you need it. In short, I have finally found the perfect night light for my budding bookworm! Riley was beside herself when we gave her the MOBI TykeLights AnimaLamp one night. She loved the cute giraffe character as well as how she could bend the neck back and forth to put the light exactly where she wanted it. It's so safe and simple to operate that I feel good knowing this is what she's now using to read by at night. The only feature that would make this product absolutely perfect would be an auto-shutoff option, so that the AnimaLamp would turn off in case your child happens to fall asleep with it. 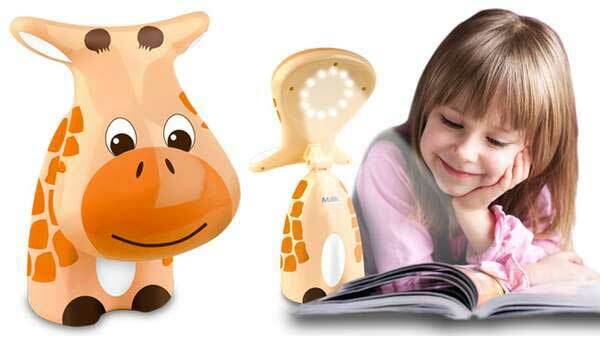 Light up your little one's life with the MOBI TykeLights AnimaLamp Portable LED Light! Disclosure: I received a TykeLights AnimaLamp Portable LED Light from MOBI Technologies in order to facilitate my review. No other compensation was received. This product review is based on my own personal experiences with this item and is completely honest and objective.